You know those people who seem to constantly post amazing travel photos on social media sites? I’m not talking about full-time travelers or professional travel bloggers here; I’m referring to those friends of yours who have regular desk jobs but just always seem to go skiing in Vail one weekend, then lounge on the beach in Hawaii, and then somehow go sightseeing in Paris shortly after that. Yeah, you know the type. I’ll be the first to admit that I can’t help but feel the tinge of travel envy whenever I see posts about other people’s travel adventures. This is especially true for me these days because my next international trip might not be until the end of the year. However, I know that the best way for me to deal with that envy is to just unplug. If I don’t want to see so-and-so’s photos from her fifth beach vacation of 2014, then maybe I shouldn’t look at her Facebook profile. It’s just that easy. And yet, there’s someone in my life who’s been traveling a lot this year from whom I can’t unplug: my husband Aaron. 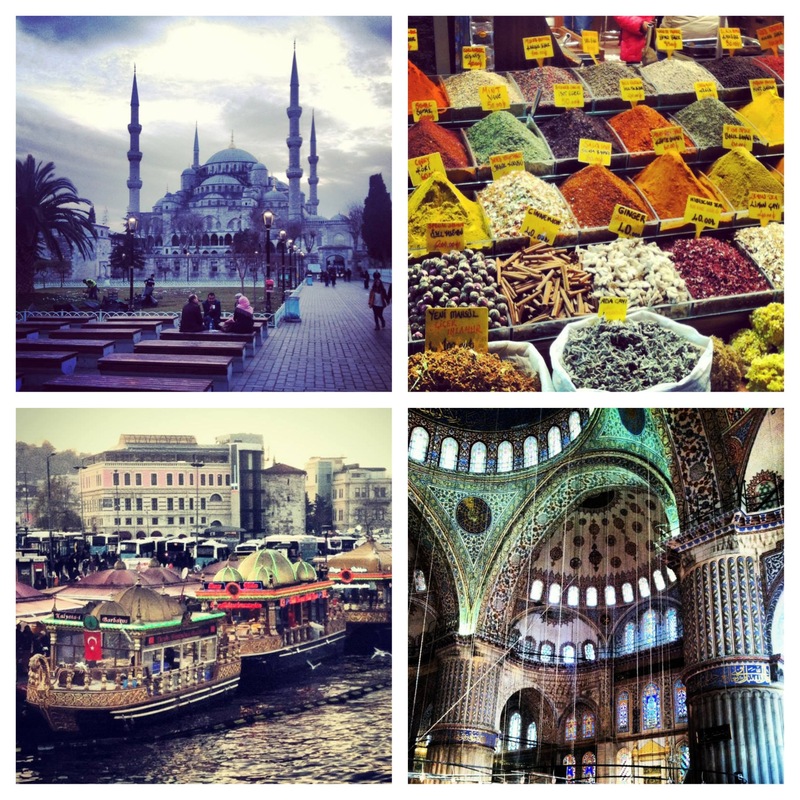 Some of Aaron’s photos from his first Istanbul trip, January 2014. We found out earlier today that Aaron’s about to go back to Istanbul for the second time this year. Last month he spent a week taking depositions in Istanbul, then spent another three days in London going to multiple Premiere League soccer matches. Granted, these trips have been for work and he doesn’t get a lot of time to just relax and play the tourist, but it’s still pretty awesome that he gets to experience one of the oldest and most culturally fascinating cities in the world, even if it’s just for a few meals and late afternoon wanderings. Last time Aaron went to Istanbul, a lot of people asked if I was going to join him. I said that I declined because I’d prefer not to go there in January when it’s so cold, I had a lot of things going on back home in SF that week, and I knew Aaron would be really busy with work. But this time around, joining him in Istanbul sounded really tempting, especially because Wendy Perrin just published this blog post about how winter is such a great time to visit Istanbul. How could I let this opportunity pass me by a second time? I should be more spontaneous, right? I could make this happen! Excited with the possibility of spending a long weekend in Turkey, I started researching flights right away. There aren’t any direct flights from SFO to IST, so the shortest travel times with layovers in either Amsterdam or Frankfurt are around 16 hours each way. Also, since I need to save up vacation days for a big trip at the end of the year, I couldn’t/shouldn’t take more than three days off for this one. So after comparing prices, travel time, and flight schedules, I’d really only have three full days to be in Istanbul, and the chances are that I’d be alone most of the time. If I was lucky, I’d maybe get a few dinners with Aaron and a free place to sleep. Hmmm, this was starting to not sound so great. Sure, I’d prefer to sightsee with Aaron, but the “being alone” part didn’t bother me too much; I backpacked solo for several weeks in Australia and Spain a few years ago, and I really enjoyed the freedom and challenges of being on my own. But the part that was most unsettling was the price tag, and the fact that I’d fly for 32+ hours just to be in Istanbul for three days. Was that worth it? I consulted one of my most well-traveled friends (you know him from his recent RTW blog posts) who spent a lot of time in Turkey last year. He said he didn’t want to crush my spirits, but he thought that three days in Istanbul would not do Turkey justice. He and his girlfriend liked Istanbul a lot, but he enjoyed the other places he visited in Turkey even more. As much as I am craving some sort of travel adventure now, his advice was to wait and do Turkey properly, when Aaron and I could really explore the country together. A mere six hours later, I’ve conceded that I probably shouldn’t join Aaron in Istanbul. Yes, it would be awesome to just up and go there for a long weekend, but maybe it’s not the most prudent travel decision for me at the moment, and that’s okay. I can still live vicariously through his Instagram photos, right? 1) I need to look around and appreciate the fact that I live in amazing city myself; somewhere that travelers from all over the world would love to visit themselves. 2) I should start planning our next big trip for December 2014! Why be jealous of other people’s travels when I can focus on researching my own vacation?